What is the expansion joints in concrete? 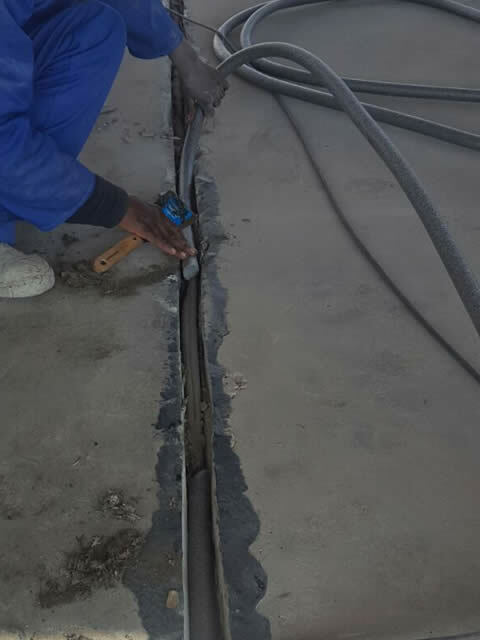 To control random cracking and handle expansion and contraction of a concrete slab due to temperature changes control or expansion joints are used. When new concrete is poured it is a fluid mixture with a plastic like mass that can be shaped into any form, but when the concrete hardens the volume reduces and shrinkage can accrue. Need your expansion joints repaired? We use high quality products. Contact us today for all your Expansion Joints Repairs and Sealing requirements! How do I fill concrete expansion joints? 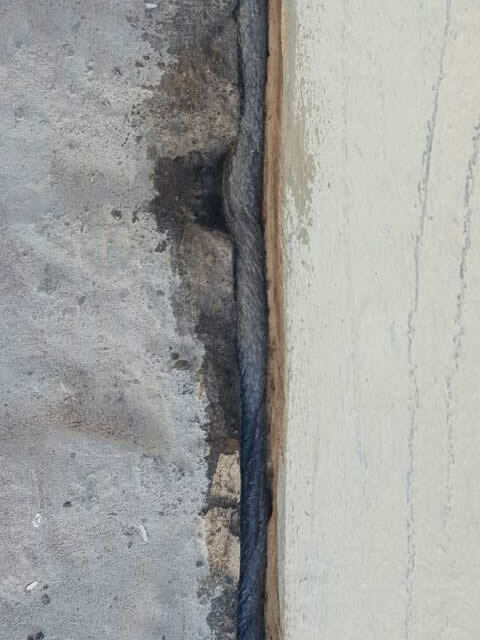 The best way to fill concrete expansion joint is to fill the space between concrete joints with a foam-backing strip and then use a self-leveling, flexible, 2 part polysulphide sealant. This sealing method will prevent water from penetrating the joint and is flexible enough to handle expansions & contractions. The Jaycoflex expansion joint sealant is a high quality elastomeric sealant for use in joints where a permanent seal against dust, dirt, water and wind is required. It may be used in expansion joints and well as normal joints up to 75mm in size. The product is ideally suited for movement joints in building and civil engineering structures such as reservoirs, taxi-ways, concrete floors, pipelines, canals, swimming pools and other water retaining structures, basements and high rise buildings. Not sensitive to moisture during cure. Excellent oil, fuel, ozone and chemical resistance. May be used on trafficable surfaces. Previously tested by the S.A.B.S. for use in water retaining structures. Accommodates continuous and cyclic movement. Getting starter – Joint preparation. Joints must always be dry before priming and sealing. Allow the Concrete to cure for a minimum of 21 days, at 25oC. Use a hand-operated grinding disc or similar equipment to remove paint, concrete and foam waterproofing strips from the joints. Clean joints down to bare concrete on the sides to ensure good bonding. Take care when grinding that joints do not become “V” shaped but rather maintain a uniform width. Cut joints so that their depth is twice their width to allow sufficient space for the backing foam. All loose dirt and concrete must be cleaned out of the joints with a soft brush. A closed cell polyethylene foam-backing strip is to be used in all joints. Sondor “Polycord” – closed-cell cross-linked expanded polyethylene foam. Any other proprietary product, which conforms to the above description, will also be suitable. The width of the backing strip should be equal to the width of the joints, and the thickness of the strip should approximately equal the width. Insert the backing strip into the joints to a uniform depth. After the backing strip has been inserted the joint should have a depth equal to its width – (if the joints are greater than 15mm wide, the depth should be half the width). In order to protect areas adjacent to the joints from becoming contaminated with sealant, a strip of masking tape should be carefully laid alongside the edge of the joint. This tape should be removed before the sealant has completely cured; i.e. within 24 hours of application. Although Jaycoflex M973 Polysulphide Joint Sealant has excellent adhesion to a variety of substrates, use of a primer is always advisable. Use Jayco G317 Two Part Epoxy Primer. This product is supplied as a 500ml pack. Add A to B and stir thoroughly. Apply to the sides of the joint with a soft bristle-brush. Allow a minimum of one hour drying time before sealing. Joints left for longer than four hours must be reprimed. Use Jayco G316 Primer. Apply with a soft bristle-brush and seal within one hour. Discard all unused primer. Use a suitable vessel with a convenient spout, such as a can or old teapot. Pour the sealant evenly into the joint, taking great care not to waste the product around the joint edges. Allow the sealant to fill the joint to within 1mm of the top. Apply M973 by hand or pressure operated closed barrel guns. For maximum economy of operation, the barrel should be approximately 320mm long. The outlet nozzle should be 2 – 3mm smaller than the width of the joint. Fill the gun by pressing the base down on the opening of a plunger plate, in the way a standard grease gun is filled, or by simply using a spatula. The sealant is gunned into the centre of the joints, ensuring at all times complete contact between the sealant and the joint surfaces. 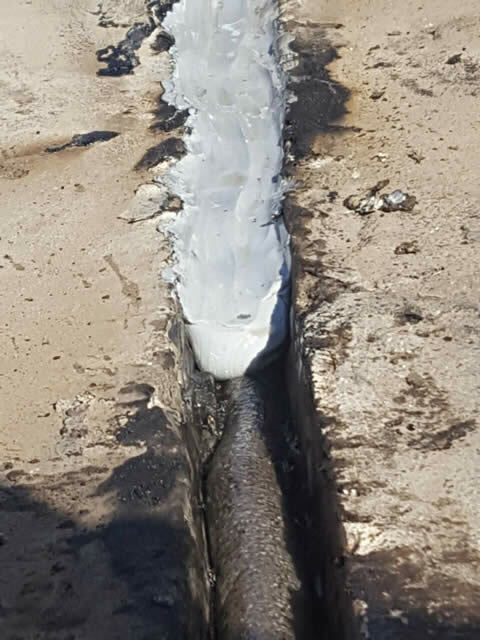 To further force the sealant into the joint and complete the finish, run a spatula, of approximately the same width as the joint, wetted with soapy water, along the joint, depressing the sealant slightly and giving it a smooth, even finish. Jaycoflex M973 Polysulphide Sealant is supplied as a 2lt combined pack. Mix together the entire contents of both cans, using a slow speed drill of sufficient power and a suitable mixing paddle. Clamp or hold the can firmly in position while the stirrer is moved around the perimeter. Mix each can until entirely uniform (approximately 5 – 10 minutes). Only when all contrasting colour streaks have disappeared is the product properly mixed. Scrape the sides of the can with a putty knife to ensure even blending.